• Lotus flower seeds powder - 1/2 cup. • Coriander leaves (chopped) - 1 tea spoon. • Finely chopped green chillies - 2 numbers. • Chat masala - 1/2 tea spoon. • Garam masala - 1/2 tea spoon. • Chilli powder - 1 tea spoon. • Hung yogurt - 2 cups. • Mint chutney - 2 tablespoons. • Grated paneer - 1/2 cup. • Sugar - 1/2 tea spoon. • All purpose flour - 1/2 cup. • Ghee - 1 tablespoon. Take yogurt in a bowl in this add salt, chilly powder, garam masala, chat masala, chopped green chili, coriander leaves mix it. Add in it Phool makhana Power (lotus seeds, popcorn, puffed rice or roasted Bengal gram) mix it andrest it for 15 minutes. Stuffing for the kebab: In mint chutney mix grated paneer and some seasonings, add chili powder, apinch of sugar, garam masala, and chat masala. Very diligently portion the curd mixture and stuff the mint mixture seal it properly. Using some refined flour shape it like tikkies. On a hot skillet pour some ghee pan fry these kebabs till they turn golden brown. Serve hot with tomato chilly chutney or sauce. The kebab is created with a mixture made from boiled potatoes, spices and greens like spinach. This kebab mix is then filled with a curd and badam stuffing and then deep fried until golden brown. A deliciously healthy and protein-rich snack item to be served with green chutneys. Dahi Kabab is a very tempting crispy and extremely mouth melting deep fried hung yogurt patties stuffed delicately with a mixture of mint, spices and cottage cheese (paneer). The kabab is a... Read More..
Dahi Kabab is a very tempting crispy and extremely mouth melting deep fried hung yogurt patties stuffed delicately with a mixture of mint, spices and cottage cheese (paneer). The kabab is attractively created with a mixture made from hung yogurt, makhana seeds powder, spiced with finely chopped green chillies and seasoned with spices and fresh herbs. A stuffing made with mint, spices and cottage cheese is blended delicately together and filled into the hung yogurt and makhana seeds powder mixture; then this is rolled into a patty and deep fried until golden in colour. Dahi Kabab is best served with any green chutney or tomato chilli sauce. Generally this type of kabab is mildly spiced and delicately cooked to perfection. The Dahi Kabab is said to have originated from the Mughals/ Nawabi cuisine and since then has ruled its place into the menu of many restaurants all over India. It is an exceptional vegetarian kabab, soft and creamy in texture. It is one of the best vegetarian kabab delicacies and would be a star dish if kept in your starters/ appetizer menu. There are different versions of making the Dahi kabab. This dish is also a classic dish from the Awadhi and Rajasthani cuisine. This kabab is widely prepared in the Kishengarh region of Rajasthan using hung curd, roasted besan flour and spices. Savouring the mildly spiced Dahi kabab with some mint chutney or green chutney will surely highlight the taste and flavours and gives a zest to your taste buds. Hung Curd Hung curd or yogurt can be easily made at home. Just tie the fresh curd in a muslin cloth tightly and hang it so that the water is drained out completely. Rest the hung curd for at least 4 to 5 hours for full draining of water. After 4 to 5 hours, pressure is applied to the bundle to squeeze out all the water and the hung curd is ready. It lasts for a long time without becoming sour. Hung curd is an ingredient used in quite few Indian and Middle Eastern recipes. This is a versatile ingredient used for preparing sweet and savoury dishes. Some popular dishes made with hung curd are: Shrikhand (Traditionally made Indian flavoured sweet yogurt), Amrakhand (hung curd sweetened and flavoured with mangoes), German cheese cake, Cool yogurt and Mayo dip, And also a variety of kebabs such as: Shikampuri kabab, Paan kabab, and Cheese chicken kebab with Pesto etc. Hung curd is also mixed with blanched vegetables and can be used as an alternative to cheese dips. Mayonnaise and white sauce can also be substituted with hung curd. Apart from its delicate tang, it also comes with a good pack of calcium, vitamins and other minerals. It is low in fat and regulates cholesterol and reduces high blood pressure. Yogurt or curd is an intrinsic part of many culinary cultures and a versatile base that is widely used from making dips and drinks to mains and side dishes. It is one of the most cooling, healthy, satisfying and comforting ingredient. Yogurt is easier to make some of the best smoothies and delight our globalized palates. Yoghurt-based dips are popular all over the Mediterranean and in the Arab world. Kebab Kebab is a dry-cooked (baked charcoal-grilled or pan fried) piece of meat, vegetables or cheese (Paneer). In general terms, a kebab is made with small chunks of meat, fish, vegetables threaded on skewers and barbecued, broiled or grilled. History states that the word kebab originated from the Arabic or Persian language and is referred to fried meat. We love grilling kebabs for mainly for their taste, smoky flavours, ease and versatility. Take the hung yogurt in a bowl and add salt, chilli powder, garam masala, chaat masala, finely chopped green chillies, coriander leaves and mix well. Add in the makhana phool powder (you can alternatively also use lotus seeds, pop corn, puffed rice or roasted Bengal gram). Stuffing for kebab: In a bowl, mix grated paneer, mint chutney and some seasoning like chilli powder, basils, dry pomegranate seeds, pinch of sugar, garam masala and chaat masala. Mix well and keep aside. Dust your hands and divide the hung curd mixture into equal portions. Gently shape them using some flour or else they become sticky. Make a small well in one ball and fill in the paneer mixture and slowly using some refined flour seal all edges and shape smoothly like a tikka or patty. Repeat the same to make other patties too. On a hot skillet, pour ghee and pan fry these kebabs gently until they get crisp and golden brown. Serve hot with tomato chilli chutney or sauce. Tip: Roasted chana powder (Bengal gram) can be replaced with makhana seeds powder. Roast it without ghee and mix it in the hung curd. Dahi kababs are extremely mouth-melting, luscious appetizers. Do try them or else you are really missing one of the best vegetarian starters that you must have ever made. Watch and enjoy cooking. Brilliant! Clear, concise and most importantly, funny! Thank you so much! This is why I subscribed to you, my good man. Sanjay, are there any recipes for homemade yogurt? Chef Sanjay, what is paneer? Where can I find it? And is there a substitute for it? BTW, your videos are the best! 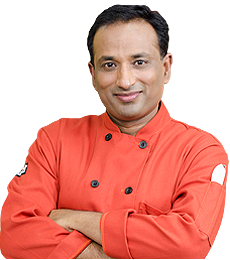 Chef Sanjay, can you make a video of chilli and tomato chutney?